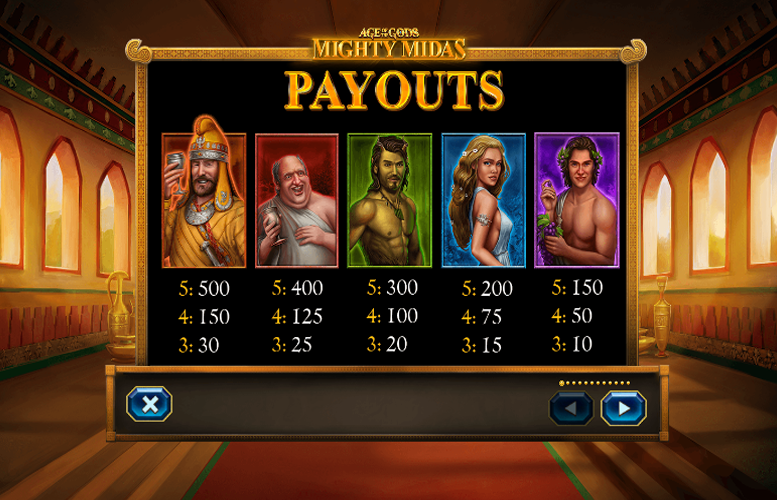 The Age of the Gods: Mighty Midas slot from Playtech is another game from the veteran slot designers that allows players to win a lifechanging sum of money in its shared progressive jackpot round. Loads of great special features. Massive upper betting limit makes it great for high rollers. Let down by weak animation and artwork. It’s not bad but with some better visual design, this slot could be a strong contender for a perfect score. The top jackpots on the Age of the Gods: Mighty Midas slot machine are all awarded for matching five of the same symbols along one of the 40 win lines. These higher value symbols are represented by members of mighty King Midas’s court. Seeing as we don’t know the characters names, we must differentiate them using their background colour instead. Midas = 500x the total bet. Red court member = 400x the total bet. Green court member = 300x the total bet. Blue court member = 200x the total bet. Purple court member = 150x the total bet. Along with the regular jackpots this slot also has a progressive jackpot which can run into the hundreds of thousands. Every “Midas Touch” symbol (golden hand) that lands on the reels will point to the symbol on the left. Every instance of the symbol that the hand points to will turn into a Gol den “Wild” symbol. These Golden “Wild” symbols substitute for all symbols except the “Scatter” symbols. The “Midas Touch” symbols will collapse after they activate, causing another symbol to drop into its place. The “Midas Touch” symbols will appear only on reels three, four, and five. 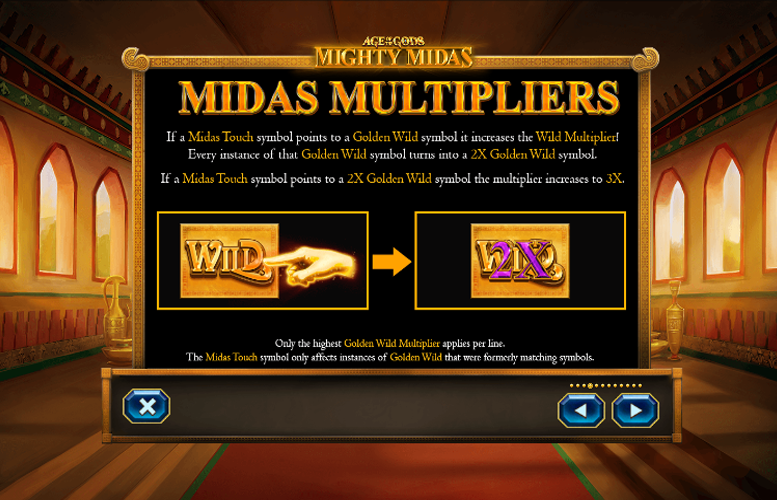 If a “Midas Touch” symbol points to a Golden “Wild” symbol, it increases the “Wild Multiplier”. Every instance of that Golden “Wild” symbol turns into a 2x Golden “Wild” symbol. Likewise, if a “Midas Touch” symbol points to a 2x Golden “Wild” symbol, the multiplier increases to 3x. Landing the multicoloured “Scatter” symbol on reel one and five simultaneously will trigger a gem feature. 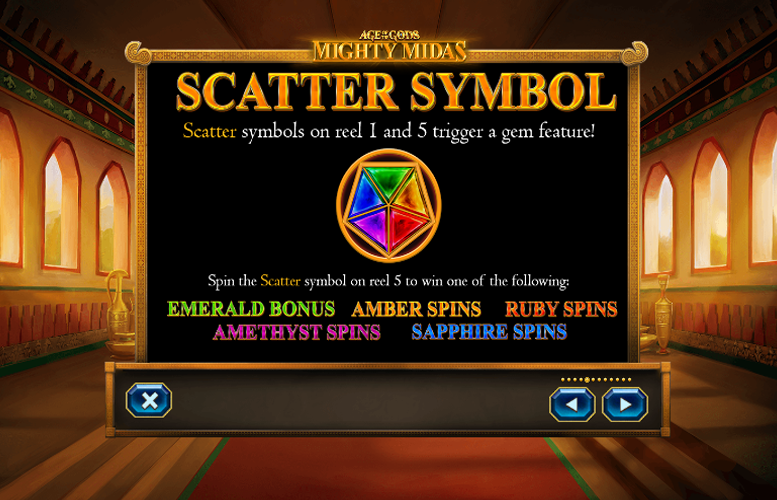 Players must spin the “Scatter” symbol on reel five to win one of the following special features: Emerald Bonus, Amber Spins, Ruby Spins, Amethyst Spins, or Sapphire Spins. 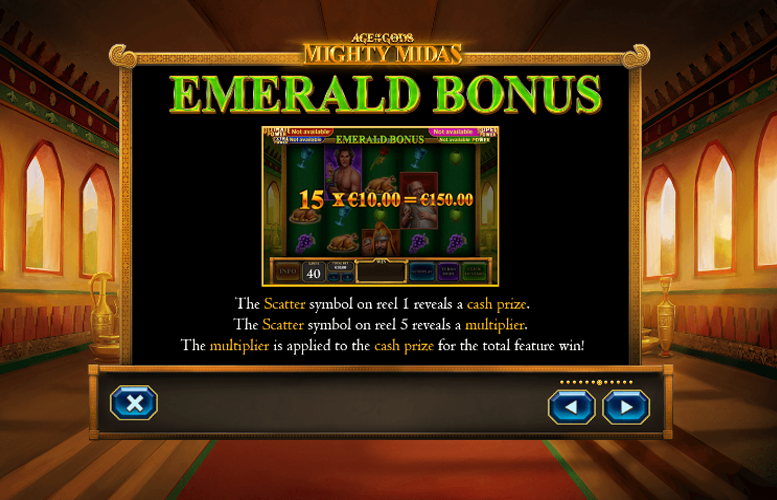 If players trigger the game’s Emerald Bonus, the “Scatter” symbol on reel one reveals a cash prize and the “Scatter” symbol on reel five reveals a multiplier. The multiplier is applied to the cash prize for the total feature win. Whenever a Golden “Wild” symbol is created during Ruby Spins, it becomes a Multiplier “Wild” symbol using the multiplier at the bottom of the Multiplier Tower. Every time a Multiplier “Wild” symbol is created, the Multiplier Tower collapses, leaving a new multiplier at the bottom of the tower. 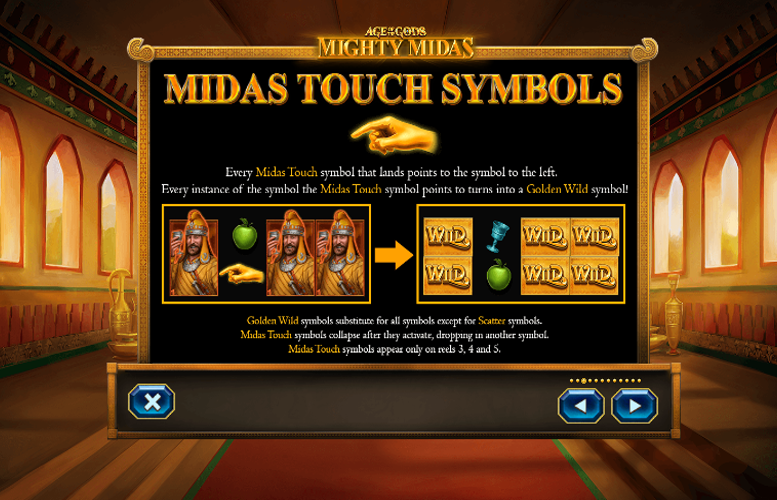 If a “Midas Touch” symbol points to a Multiplier “Wild” symbol, the two multipliers are added together. On each Amber Spin, one random symbol is chosen to spin in as a Golden “Wild” symbol. On the first of the five Sapphire Spins, 55 extra “Wild” symbols are added to reel two. On the second of the Sapphire Spins, 40 “Wild” symbols are added to reel three. On the third of the Sapphire Spins, 65 “Wild” symbols are added to reel four. What’s more, all added “Wild” symbols will remain in their position for all five of the Sapphire Spins. During the Amethyst Spins feature, all “Midas Touch” symbols are double stacked. Many of the titles in the Age of the Gods series share the same progressive jackpot. In the Jackpot mode, players will win either the Power, Extra Power, Super Power, or Ultimate Power jackpot. The Age of the Gods Jackpot mode is triggered randomly. Any spin of any amount in the game can activate the jackpot mode. This includes spins with no game wins. However, the higher the bet, the greater the chances of entering the mode. Once activated, players are guaranteed to win one of the jackpots on offer. To play the game, players must select from the 20 gold coins hiding different jackpot symbols. Once they reveal three of the same symbols, they will be awarded with the relevant progressive jackpot. Chicken = 125x the total bet. Rose = 100x the total bet. Apple = 100x the total bet. Goblet = 75x the total bet. Grapes = 75x the total bet. 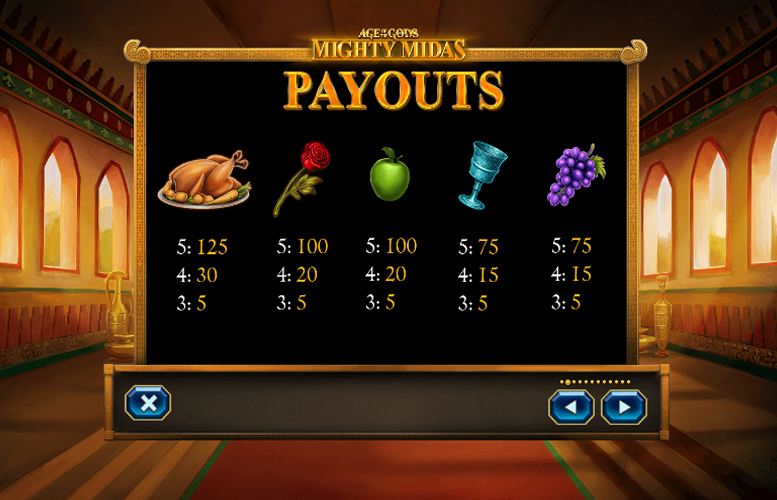 The Age of the Gods: Mighty Midas slot machine only offers players the chance to adjust the total amount bet per spin. The number of win lines is fixed at 40. Bet amounts range from just 40p right up to £2,000. This makes Age of the Gods: Mighty Midas ideal for those nose bleed stakes players out there. 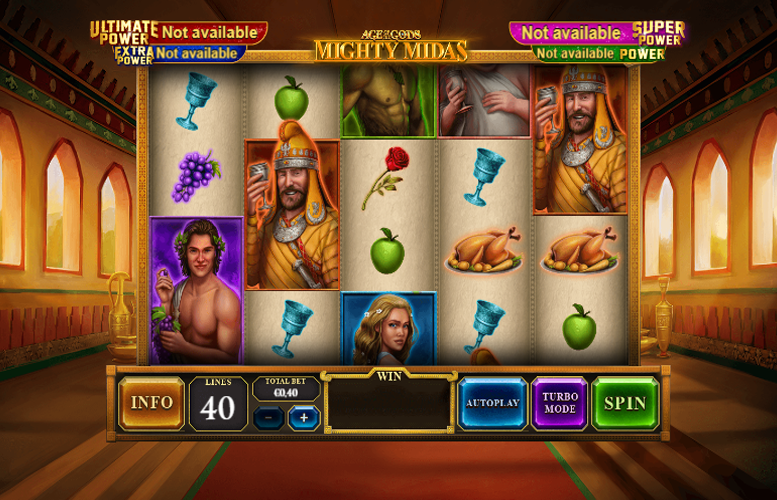 There is very little to dislike about the Age of the Gods: Might Midas slot machine by Playtech. In terms of gameplay itself, the title is one of the strongest we’ve reviewed. The package is only slightly let down by its artwork. There isn’t anything particularly bad about it. It just lacks the “wow” factor needed to give the game a perfect score from us. This game has a rating of 4 / 5 with 621 total reviews by the users.